On a track still slick with this morning’s rain, Neil Hodgson slid his HM Plant Duacti into another provisional pole position ahead of Sunday’s debut Silverstone World Superbike round. 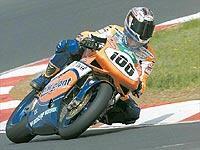 Hodgson time of 1:54.095 was three tenths faster than second placed man, Honda’s Colin Edwards. Ben Bostrom was third quickest, six tenths ahead of Chris Walker’s Kawasaki in fourth - his best qualifying performance of the year. But the mixed conditons threw up some surprising results. Glen Richards was the best placed British Superbike wildcard, taking his Hawk Racing Kawasaki ZX-7R to sixth, ahead of Steve Hislop. But it was a day to forget for series leader Troy Bayliss. He qualified down in 10th place, a second and a half behind Hodgson and fell on the last lap. Noriyuki Haga didn’t enjoy his first visit to the circuit either, his qualifying time of 1:59.765 was only good enough for 16th spot. 1)N Hodgson 1:54.096 2) C Edwards 1:54.404 3) B Bostrom 1:55.098 4) C Walker 1:55.795 5) R Xaus 1:56.146 6) G Richards 1:56.216 7) S Hislop 1:56.284 8)M Rutter 1:56.382 9) J Toseland 1:56.643 10) T Bayliss 1:56.705 11)S Byrne 12)P Chili 13) M Sanchini 14)D Ellison 15) M Borciani 16) N Haga 17) P Goddard 18) S Martin 19)G Lavilla 20) S Foti 21) M Heckles 22) J B Borja 23) B Parkes 24) E Bostrom 25) L Pedercini 26) I Clementi 27) A Antonello 28) Y Gyger 29) J Mrkyva 30) B Stey.